Casa Durango is a charming 3 bedroom 1 bath 1300 sq ft home located on Durango's northwest grid. Our home was originally built in 1896 and was recently updated to include a new kitchen, bathroom, interior paint and furnishings. It still has that vintage feeling but has all the modern amenities. Our home, like most homes in Durango, does not have AC, but the temperature is easily manageable. The kitchen is fully stocked with dishes and utensils and the dining table comfortably seats four and does have an additional leaf to seat a few more. The living room has a L-shaped couch, large ottoman, a Samsung 40" tv with DirecTV and high speed WiFi. Two bedrooms have new comfortable queen beds and the third bedroom has a new twin daybed with trundle mattress and all have high quality linens and pillows. The third bedroom also has a large beanbag, 36" Flat screen TV with DirecT & Roku and many shelves containing games and puzzles. The backyard is fenced and there is a new gas BBQ on the deck. During the summer there is a outdoor dining set on the deck which seats six people. Our house is dog friendly. The garden is fairly well fenced but not secure enough to contain a pup who really wants to explore the neighborhood. Walk, hop on one of our cruisers (5 available) or take the Durango Trolly which stops 1 block from the house into the historic downtown district for dinner, shopping, bars or to just wander around. There are so many great outdoor activities in and around the Durango area: Durango Silverton Narrow Gauge Rail Road, Mesa Verde National Park, Durango Mountain Resort, Sky Ute Casino, Telluride, Gold Medal fly fishing, Animas River, horse back riding, golf, skiing, Jeep tours, rafting, hunting, kayaking, historic district, shopping, world class mountain and road biking, scenic tours and motorcycle touring. The Animas River is only a three minute walk from the house. If you choose to walk downtown, the swing bridge over the Animas River is only blocks away as is the bike path. Historic downtown Durango is less than a mile from the house and an easy walk. Wake up to the whistle of Durango Silverton Narrow Gauge Train and we hope you enjoy your stay at our home. Johnny and I love Durango and we hope you will too. We try and get back there as often as possible and by recently turning the house into a vacation rental (v. a long term rental) allows us to actually stay in the house when we visit. We are Northern California natives and currently reside in Corte Madera, CA. Johnny bought the house sight unseen after visiting Durango to visit a friend who had lived there since college. The residential neighborhood is convenient to everything and the neighbors are all very friendly. It's a funky old property that was build in the late 1800's. It has a lot of heart and still has that old rustic, southwest cabin feel. There is a outdoor dining set which seats six on the deck and a two person hammock and horseshoes in the back yard. There is a new PaknPlay in the third bedroom. We had a wonderful stay here this March and would have stayed and extra week if we were able! This was probably the most well-stocked rental I’ve ever stayed in (including non-stick cookware, which for whatever reason seems to be incredibly hard to come by in vacation rentals). The house is nicely updated to be super comfortable but also still very charming. Our pups loved both the front and back yards and my husband and I enjoyed taking the cruisers down the river path and on quick rides in to town. On top of all that, Lisa was a pleasure to deal with. We would absolutely stay here again the next time we visit Durango! Love the little house and the location. Nice house with a good location. Very quick responses from the owners when we had minor issues. Would definitely stay here again. fabulous, cozy and homey property-walkable to downtown and river. My doggies enjoyed sunning on the back porch with a secure fenced back yard and it was a totally relaxing stay. Can't wait to stay again in the future. This was the most effortless vrbo we have ever had. The house was attractively decorated, the beds comfortable and the kitchen stocked with everything we could possibly need. We found ourselves enjoying the deck out back more than I ever dreamed would happen. The fenced yard was a blessing for us and our dogs. The owners very responsive and flexible. I can't say enough positive things about this entire experience. Thanks so much for the fabulous review! We’re so glad you and the pups enjoyed staying at the house and exploring the town. Hope you come back and stay again in the future! 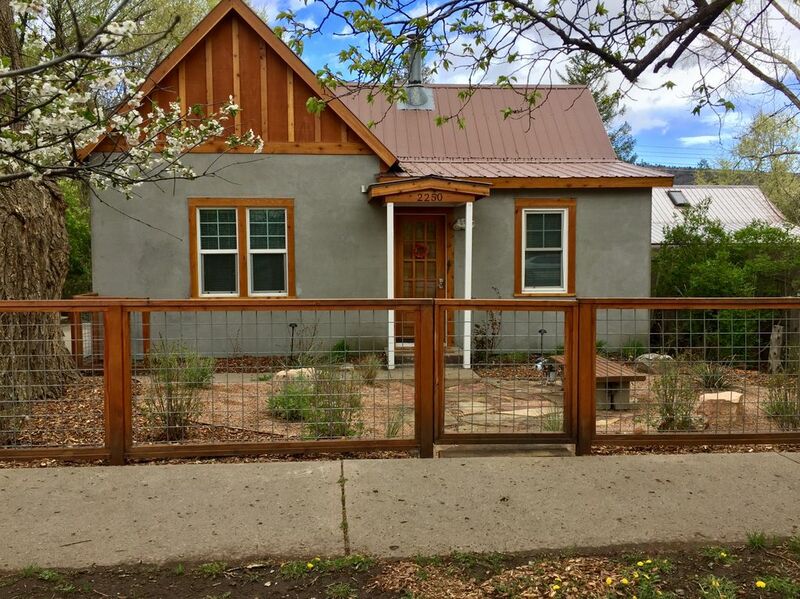 The house is in a nice, quaint neighborhood about 1 mi from Historic Downtown Durango. The location was perfect for us to get up north of town for good hiking and fishing but you can easily take a 5 minute drive and be in the heart of everything if you want or use the bikes in the garage to explore. I can't say enough about how clean everything was inside and out and how well stocked from essentials in the kitchen to the bath. There was famer's market open daily just one block away on Main St. where we got fabulous fresh veggies and fruit and Durango Joe's just a short bike ride away for wonderful coffee. The house is ample size for a family or a few adults as long as you don't mind sharing a bath. Lots of games and a TV in the living room and den/3rd bedroom although we enjoyed outside too much to be indoors playing ! Thanks for the great review! We’re so glad you enjoyed the house and location. Hope you come back and stay again! Holiday Rates may be different. Please inquire about specific dates for rates.